Working with Harry has been a very pleasant experience. Are you looking for a way to promote your next event, business, or political campaign? You might be interested in Yard signs. These signs are also referred to as bandit signs or, coroplast signs. These are an ideal way to advertise your next special event, tell your potential customers all about your business and promote your products to your potential clients. They’re also suitable for showing the world who your favorite candidate is and you don’t have to invest much money to do so. 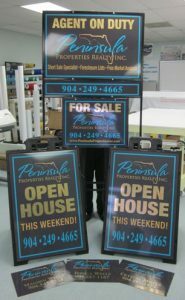 Shine On Signs & Graphics creates quick and efficient yard signs to fit all of your business needs. With state-of-the-art equipment and our customized manufacturing process, you’ll have banners, yard signs, and any other promotional signage that you need for your organization or your business. Call Shine On Signs & Graphics today at (425) 336-4511 for your Free Consultation with a Yard Sign Specialist! It won’t matter the type of business that you’re running, yard signs have long been a proven method of advertising and marketing. They’re one of the most effective means of marketing your business. Our sign specialists will help you to craft an innovative, unique, yard sign that will capture your brand and improve the visibility of your business regardless of whether you’re a retail store, a non-profit, or a provider. To improve and increase visibility for such events as walk-a-thons, craft fairs, Vacation Bible School and such. Promote business services and products. As a complete sign shop, we’re committed to taking care of every aspect of your signage. From the moment you schedule your free consultation to the moment you have your signs removed and replaced, we’re there for you. If you have ready to print files we are more than happy to assist you with those! Most of our signs can be fabricated in as little as 24 hours; however, some of our signage solutions can take longer depending on the size, type and amount. We work together with you create signage elements to suit your goals. 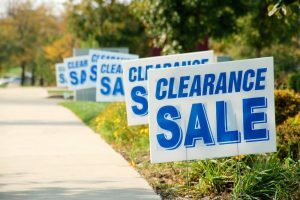 Many businesses rely on yard signs for a variety of reasons. Real estate is one of these businesses. Signs for yards are frequently used to point out open houses, houses that have been sold, and other information regarding homes. These signs are also used to promote brands and even to help pass out flyers and brochures. 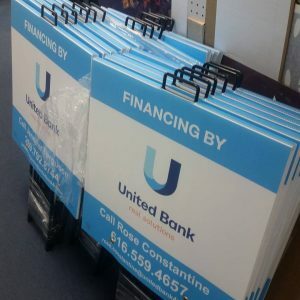 Our services aren’t limited to just yard signs, we also design and create customized real estate sign holders, as well as indoor and outdoor signage for your company including; storefront signs, lobby signage, outdoor banners, and more. The goal of our services is to become your sole-provider for all of your signage needs. Yard signs aren’t just for real estate. Yard signs are also ideal for election season as they are inexpensive and portable. Candidates utilize yard signs as they are convenient and easy to use and they can increase the visibility among the constituents. Frequently, signs are given out during rallies. They’re available to order on the campaign website, and they are often handed out by supporters or even the candidates as they canvas local neighborhoods. These signs have become a common sight around town as a useful and practical advertising tool. Friendly service and quick turn-around. I recommend Shine On Signs to all of my clients for interior and exterior signage.